The 4-man packages are the result of adding one additional defender to the front. They can be any of the single backer Dogs or Blitzes. All of the coverage packages can be used in 4-man packages; however offensive sets could require a coverage call change (check) at the line of scrimmage. This is a combination, straight-ahead blitz to the callside (Eagle) or boundary (Bandit) by the outside invert. 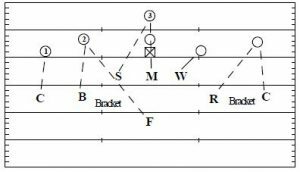 The Eagle attacks the B-gap and the End will use a “scalp” slant to the C-gap based upon a “me” call by the inside linebacker. The Eagle communicates with the inside linebacker to make the call to the End. This is a zone blitz, an illusion 4-man pressure package. The callside (or boundary – short) End will engage the offensive tackle controlling the C-gap. If the End reads pass they will drop into the hook-curl zone. The callside (Sam – short) Stud will execute a run-through Dog in the B-gap. The linebacker makes a “me/you” call. This is a zone blitz, an illusion 4-man pressure package. 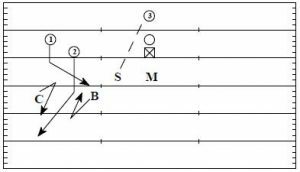 The openside (or field – Wide) End will engage the offensive tackle controlling the C-gap. If the End reads pass they will drop into the hook-curl zone. The callside (Sam – short) Stud will execute a run-through Dog in the B-gap. The linebacker makes a “me/you” call. This is a zone blitz, an illusion 4-man pressure package. The Nose will engage the center controlling the weak (Nag) or field (Short) A-gap. If the Nose reads pass they will drop into the hook zone. The Mike will execute a run-through Dog in the callside (or Short) A-gap. The Mike makes a “me/you” call. This is a zone blitz, an illusion 4-man pressure package. The Nose will engage the center controlling the strong (Nag) or boundary (Wide) A-gap. If the Nose reads pass they will drop into the hook zone. The Mike will execute a run-through Dog in the openside (or Wide) A-gap. The Mike makes a “me/you” call. 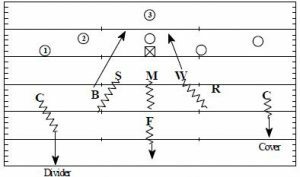 More on the 3-3-5 Defense…. 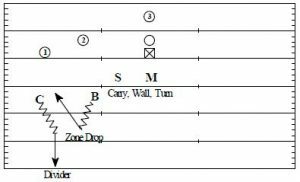 The concepts used in zone coverage have evolved from guarding areas to match up zones. A match up zone includes a combination of pattern recognition and coverage techniques. The defenders must first identify the offensive personnel and formation, then at the snap of the ball makes a run/read. Once the defenders have recognized pass, they begin to execute their zone drop techniques. The receivers’ routes will dictate the techniques. The following diagrams detail a few of the match-up zone concepts. Corner – uses divider technique versus vertical routes by #1 and #2; drop splits the verticals. or #3 if their route takes them to the flat. Mike – drops hook, unless the Stud is on a Dog, in which case Mike replaces Stud. Corner – cover #1; remember #2 can become #1 if they cross. Route recognition is crucial. Eagle – “buzz” technique to get under #1, while maintaining outside leverage on #2. “LEE”, “MOH” and “RAY”, for left, middle, right. This technique is used in 5-man pressure packages and Cover 33. Here is a list of some additional points and considerations in zone coverage. On the snap of the ball key quarterback, receiver and backfield action. Never allow a receiver to get behind a defender when he has deep zone coverage. A defender in zone coverage should go only as wide and as deep as he has to in order to cover his responsibility. See the ball – the defenders attention should be directed towards the passer and he should see the receivers. Keep head on a swivel and be able to shift your eyes – referred to as “melt to the quarterback”. “Ball” – “Score” are calls used in the passing game. The sideline should be active yelling “ball” when the quarterback throws the football, and the defender intercepting, as well as the sideline should be yelling “bingo” to indicate an interception has been made. Most interceptions are made as the defender moves forward for the ball. Intercept all passes at their highest point. Do not wait for the ball to come down. Go get it! Ball reaction is paramount to successful zone pass defense. Instill the importance of communication. Talk to your teammates; help each other. Calls such as “in-in-in-in”, “out-out-out-out”, “cross-cross-cross”, “delay-delay-delay” and “crack-crack” are very helpful to the team defensive approach. When responsible for a short zone, gamble for the interception. When responsible for deep zone, defender should never go in front of the intended receiver unless he can get both hands on the ball. Be aware of the red zone (20 yards and in), as the short defenders should be no closer than 7 yards to the sideline until the ball is thrown in that area. Interference results when a defender plays the receiver rather than the ball. The free safety in cover 3 and both safeties in cover 2 should keep all receivers in front of them. Corner’s responsible for the outside 1/3 should never take an inside fake, because you will always have help on the post route from the deep 1/3 safety. Easy to stem and disguiseThe defender must watch the receiver until he is sure that the receiver is on his last cut – then “snug up” and watch the quarterback. The defender will still use his 3-slide steps reading the key, and then get into the action. Never jump an initial outside fake, always take the initial inside fake. This can be accomplished when the defender maintains a separation, or is on top of the receiver. When the receiver straightens up, he is getting ready to fake, when the arms go up break on the ball. 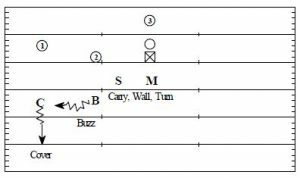 “Banjo” is when two secondary players (C, F, B, R) use an inside / outside approach to covering 2 receivers. Each defender will cover his assigned receiver until their routes cross, at which the defenders switch responsibilities. This technique helps avoid the rubs and picks that receivers use. corner or outside inverts (Eagles) will defender their man with outside leverage and the safety or outside inverts (Eagles) will defend the inside cut. Here is a list of some additional points and considerations in man coverage. Total concentration must be on the receiver. Always keep the receiver in front. Never align or be driven to a head up position. 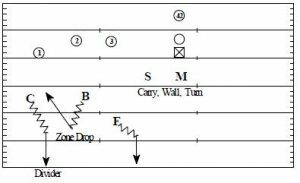 Route recognition – A receiver who is going to run an outside route will generally reduce his split. A receiver who is going to run a route inside will widen his split. him within 3 yards of the defender, when this happens turn and run with receiver. A receiver who is bent over and running with his head down cannot make a sharp cut, until he raises his shoulders and gathers himself under control. Therefore the defender should focus his attention on the receiver’s belt buckle and his shoulders. Playing bump and run – Never allow an inside release by the receiver, make the quarterback make the long throw. Don’t get your feet crossed over. If a pass is thrown to your receiver in front of you make all drills attack the up field shoulder. Never go in front of a receiver unless you think you can get both hands on the ball. If the defender gets beat deep, tell him to put his head down and sprint to catch the receiver. Do not look back at the quarterback until you have caught the receiver. As long as the ball is behind the line of scrimmage and receivers are downfield, always maintain tight coverage.